Our hearts go out to the people of France for their loss in the April 15, 2019 fire. A 32 by 58 inch (external measure, frame included) copy of this image will be at Gallery Los Olivos. Impressions of NYC is a small collection of some shots I took as a tourist in New York City in July 2010. Hubble-Monocerotis-Dunes print. As one who has long been fascinated with exploring our universe through optics, it was an honor to meet the founder of the optical company that built the Hubble space telescope; by chance he was a friend of the family. Follow the link to the left for more information. For the Index and Thumbnails of the other, older photos in my internet gallery click here. I have a permanent display at Gallery Los Olivos, in Los Olivos, California. I am generally at the gallery from 10 - 5, the third Thursday of each month. (You can call Gallery Los Olivos at (805) 688-7517 and have the gallery sitter check the calendar.) Please feel free to stop by the Gallery on one of these days or any other time. For information on Gallery Los Olivos, click here. For technical information on printing and related subjects, please go to www.PaulRoark.com/BW-Info/. At www.PaulRoark.com/BW-Info/ I cover or link to numerous current as well as older inksets and workflows that I have used in the past. MIS Associates (inksupply.com) continues to sell many of the older inksets that I developed; all such work by me has been on an open-source, royalty-free basis. I just make and continue to make what I want and have allowed all to use my formulas and profiles as they saw fit. Of particular interest to B&W printers who want the best for the least, the generic dilution base formulas for diluting matte black pigment inks is also linked to this page. These allow creative printers to make their own unique and very cost effective inksets. My primary wide format printers now have variants of what I call a "Carbon Variable Tone" inkset in them. This puts 100% carbon pigments, which are by far the most lightfast, in all but one of the ink positions. In one ink position I have a specially formulated "toner" that is light blue. This gives a print tone range from warm (natural carbon) to neutral, while at the same time keeping the job of making profiles rather simple. The basics of the best B&W printing are simply to keep the carbon content as high as possible for the tone you want, and use the best pigments available. This maximizes longevity and virtually emiminates artifacts such as metamerism. Optimizing the image capture phase of my medium has also been a challenge I have enjoyed. Part of what contributes to a slightly different take on the world comes from exploring it with new and different tools. My current favorite camera is a Sony a7rii that has been modified by having a KolariVision Ultra-Thin cover glass replace the thick cover glass of the OEM Sony. What it allows me to do is use Leica-M lenses on the state of the art Sony A7r series of full frame cameras. See http://www.paulroark.com/BW-Info/KolariVision-UT-filter.pdf Note that when this modification is made, the OEM Sony optics no longer give a good image. The cover glass is part of the optical formula. I've chosen to stay with Leica-M manual focus optics. In my view, this combines the best optics with the best full frame sensor. If you are interested in prints of any images on the web site, please contact me. In general, B&W prints are available in a number of sizes from 8x10 up to 44" wide (9800). All are printed with a dedicated B&W, carbon pigment inkset of my own design). I do not sell color prints. In general, prints at the 11 by 14 inch size on inkjet paper are sold on an open edition basis. Large canvas prints will be limited to 10 per image on canvas. This does not affect the separate limits on other media, such as Arches watercolor paper. Arches (and other un-coated) watercolor full sheet prints are also limited to 10 per image. All of my prints are made individually, as needed. It is my intention to never become a large volume printer. Generally, I think the "limited edition" approach has to be approached cautiously for the type of photography and printing that I do. Images evolve and change with time, as my then-current preferences for the look of a print change, as do the technology and materials I use to make the print. As such, my approach to this issue is sometimes a bit different than those who are making copies of a painting. I try to balance the limited quantity with the ability of the image to evolve (and my life expectancy, of course). Note that Ansel Adams sold open edition prints -- massive numbers, often printed by assistants. His most famous images improved as he refined his printing techniques and as materials improved. Stopping the evolution of an image is a big mistake for photographers who are also printers pushing the limits of the medium. "Moonrise, Hernandez, New Mexico" is Mr. Adams' most famous example of how prints can evolve. Arches prints - "Carbon on Cotton": I consider my most archival print technology to be carbon pigments on Arches Hot Press (uncoated) watercolor paper. Note that I often print on the back side of the arches for a more interesting texture and better durability. This paper is not inkjet paper, but the finest cotton-based watercolor paper. With no coating to crack or flake off, it is expected to have a much longer life than coated inkjet papers. Carbon pigments are also not standard inkjet pigments. They are much more lightfast than any major commercial printing system. This "carbon on cotton" medium, with the inkset and workflow being developed by me, establishes a benchmark of archival imaging and is a rather unique printing technology that I am proud to have pioneered. As noted above, I have imposed a lifetime limit on all such images. I will never produce more than one full sheet carbon on Arches print per week. This limit also applies to large canvas prints, but for a different reason -- their size. Carbon pigment on Arches prints I make for others using their files/images are not included in any of these limits. Inkjet paper prints - Unless otherwise stated, prints are sold on an open edition basis. Most of these are the 11x14 prints noted above, but some are of other sizes. As with all of my fine art prints, however, I make one print at a time, as needed. Thus the overall number of prints I make will never be very high. Canvas prints - I had a show in September of 2017 that featured large canvas prints. While it was well received, I tend to favor the Red River Satin paper for even large prints. The canvas texture interfers somewhat with the details of the photos. On the other hand, for huge prints, it is a medium that does have a place in B&W photography. Note, however, that only a few of the canvas media have the dmax needed for good B&W printing. The January 2010 issue of Rangefinder magazine has an interview with me and some of my photos. To check it out on line, click here. The October, 2010 issue of "Cowboys & Indians" magazine also has a short article about me. See it here. I use several Red River Paper products and beta test some of their papers. They have a short blurb about my work here. 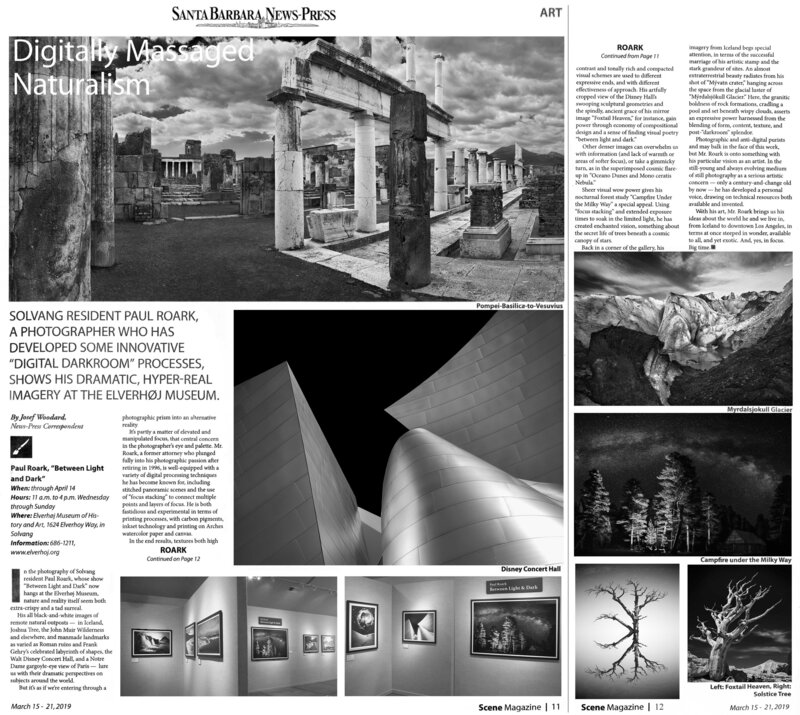 The December 2013 "Shutterbug" magazine, in the Digital Help column regarding inks suggested, "visiting a black-and-white expert's website, www.PaulRoark.com." In June 2018 I was featured on the Red River webpage/blog. The article can be see here. From mid-Februry to mid-April a broad cross-section of my work was featured at the Elverhoj Museum in Solvang, California. Click here for a copy of the postcard relating to the exhibit. If you were interested in any of those images, contact me at Roark.Paul at Gmail.com. For a copy of the review of the Elverhoj show by the SB Newspress, click here. And there is always an exhibit of my work at Gallery Los Olivos (see above). 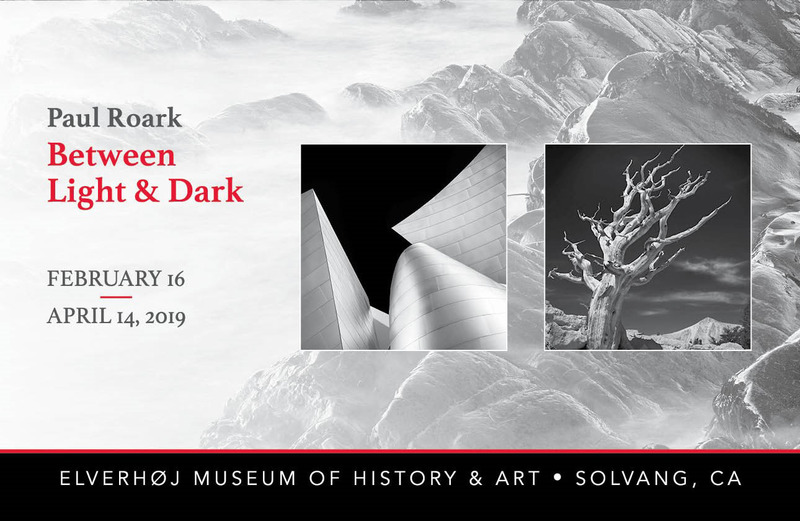 As part of Solvang California's centennial celebration, the Elverhoj Museum in Solvang displayed numerous historic images that have been contributed by local residents, and digitally restored and printed by me. While the gallery show at the Elverhoj is no longer up, some of the images remain in the permanent displays at the Elverhoj Museum. Additionally, Montecito Bank and Trust at Alamo Pintado and Highway 246 has a good display of some of my favorites. These are 100% carbon prints. For information about the Elverhoj museum and for a book of the old photos, click here. For a PDF that briefly explains some of the procedures I used to restore the old photos, click here. If you have any comments or questions, or are interested in copies of any of my images, please do not hesitate to contact me at Roark.Paul@gmail.com. Thank you for visiting my humble website.